I used Pink Argentine shrimps in this recipe. They're a deep-water shrimp caught wild in the Western South Atlanta area. Most important, pink Argentine shrimps are wonderfully sweet and tender. Some descriptions suggests that shells are thicker but I didn't find that to be so for the ones I had bought--and I've bought them several times already this year. To support the sweetness of the pink Argentine shrimps, I added a sweet Vidalia onion and red hot cherry peppers. These peppers are really very mild in heat. I have tried jalapeno peppers, even pepper jack cheese. The jalapeno was very nice with Monterey Jack. But I would not recommend pepper jack cheese. I found the flavor just too harsh for the delicate sweet taste of the pink Argentine shrimps. Pink Argentine shrimps will turn the butter or any liquid pink. If you decide to steam them rather than sauteing them in butter, don't be alarmed if the water turns pink. In the second image, I try to show the layered quesadilla with shrimps on the bottom, then the Vidalia onions and finally lots of shredded Monterey Jack cheese. 6 ounces of Monterey Jack cheese, roughly shredded. Set aside 1-2 ounces for garnish. Divide remaining cheese into two halves. 1. Clean shrimps and remove tails but leave tails on for 8 of them. These will be used as garnish. Sautee Vidalia onions in 1 Tablespoon of butter until soft and translucent, approximately 2 minutes. Set onions aside in a plate and divide into two halves. 2. Melt 1 Tablespoon in the skillet. Add shrimps, garlic and hot red cherry peppers. Cook shrimps on medium high heat for 2 minutes. Turn and cook for 1 minute. Transfer shrimps to a plate and be sure to toss with the garlic and red hot cherry peppers. 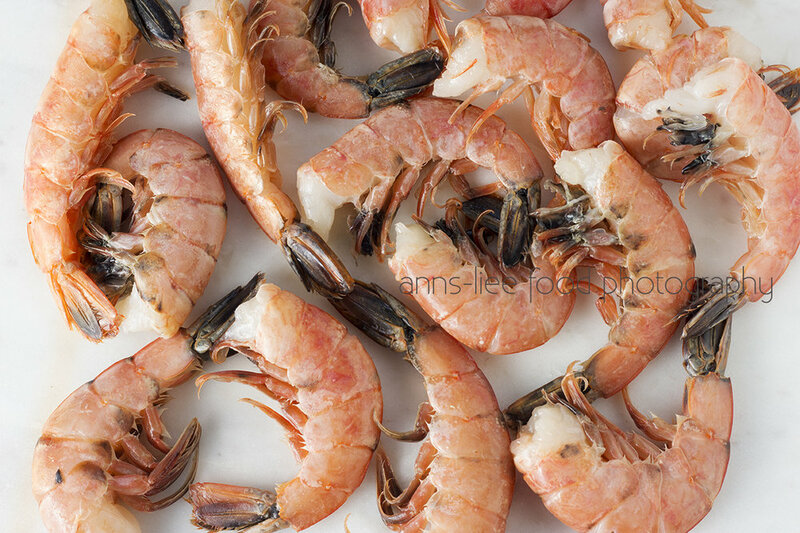 With exception of shrimps that have the tails on, cut the tailless shrimps into thirds and fourths depending on the length of the shrimp. Divide mixture into 2 halves. 3. If using one skillet, quickly wash it out and return to heat. Melt butter in the skillet. Add one tortilla. Gently move it around in the skillet to make sure the buttered side is completely covered. While the buttered side is browning, spread the chopped shrimps on one half of the tortilla. Layer one half of the Vidalia onions over the shrimp. Layer one half of the shredded Monterey Jack cheese over the onions. 4. Fold the empty side of the tortilla over the layers of shrimp, onions and cheese. Only to continue cooking just for a few seconds, until cheese has melted. DO NOT TURN OVER THE QUESADILLA. It may fall apart and you will have a mess! 5. Transfer the quesadilla to your serving plate and cut in half. Top each half with two of the shrimps that have the tails on. Complete the garnishing with the remaining shredded Monterey Jack cheese. You'll love the extra bites of shrimps and cheese!